The winner of our Stick’Em Up competition is Andrew Marson from Wigan with this great looking image taken whilst on holiday in Istanbul this year. 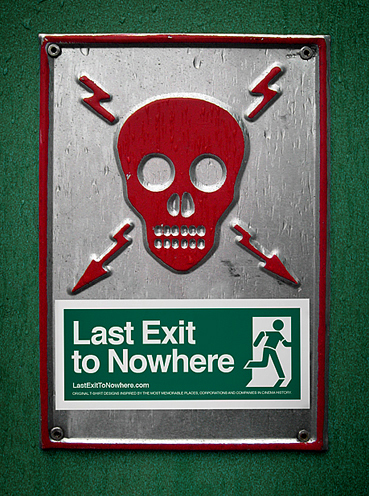 With every purchase you make from us you should receive a complimentary Last Exit to Nowhere ‘EXIT’ sticker. Use it in an interesting way and send us pictures of it for a chance to win 3 T-shirts from our range too. This competition isn’t limited by a timescale and winners are chosen at our discretion. Send entries to info@lastexittonowhere.com – it’s all about the placement!